You otherwise do not have direct access to the server running the database. Data is collected from MySQL’s PERFORMANCE_SCHEMA or PostgreSQL’s pg_stat_statements. See the Enabling PERFORMANCE_SCHEMA and pg_stat_statements section below to enable these. Open the installation wizard by clicking “Setup your first host” or “Add New Host.” Select “Off-Host” and then your database type. 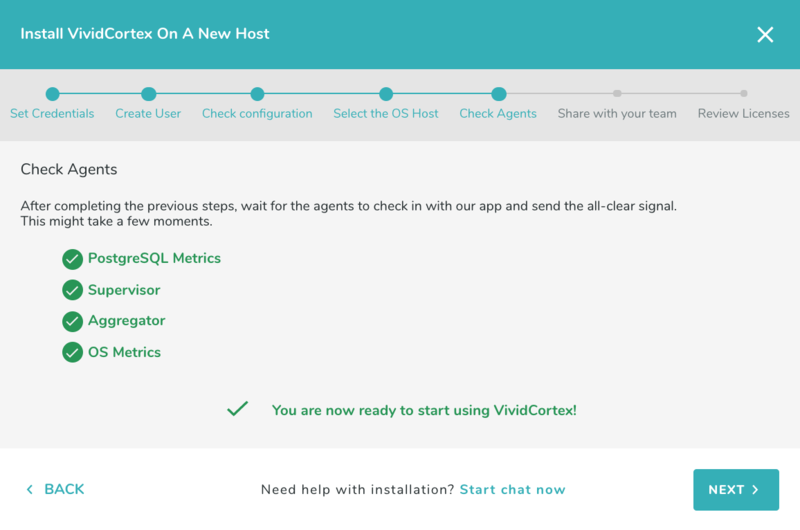 Enter the address of the service you wish to monitor, as well as the credentials for VividCortex to use to connect. When monitoring an Amazon Aurora cluster, you will need to monitor each node as a separate instance, using the instance endpoints; do not use the general reader/writer endpoints. If you have not already created a user with the correct privileges for VividCortex to use, you should do that now. Select “Create User”. The wizard provides the basic steps to create a MySQL user with the necessary privileges for the agent to monitor the database. 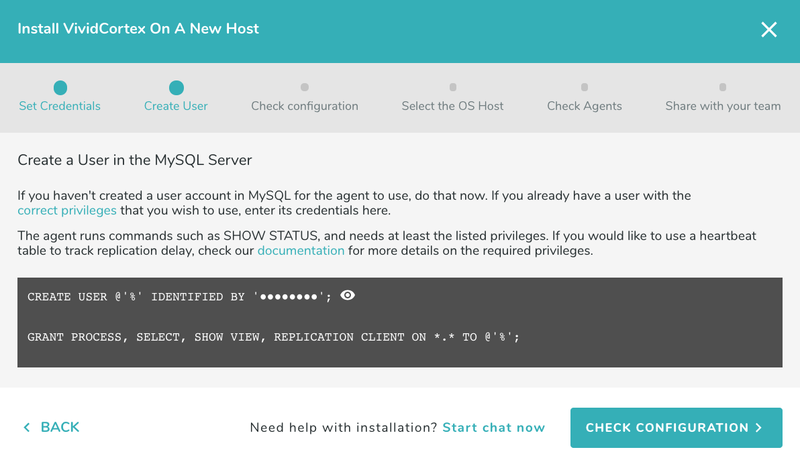 For more information about these privileges and the purpose each of them serves, refer to the MySQL section in our Privileges documentation. Make sure you have PERFORMANCE_SCHEMA enabled (see instructions on how to enable it below). For all versions of PostgreSQL (including Amazon RDS), query performance statistics are captured from the pg_stat_statements extension. The extension must be enabled (see instructions on how to enabled it below) and the monitoring user must have the SUPERUSER (or rds_superuser) privilege. We have created a script which will automate the process of installing PostgreSQL monitoring in an off-host configuration and we recommend you use it in this step. Please refer to the “Scripted” section in the Privileges page. 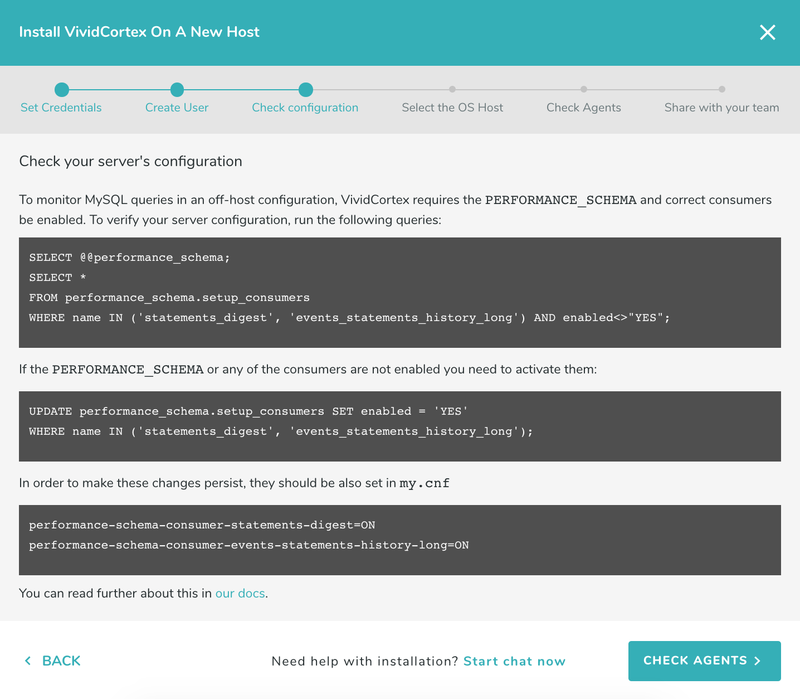 As an optional workaround, VividCortex supports non-SUPERUSER monitoring for PostgreSQL by defining functions for the monitoring user. Once confirmed, click “Select the OS Host”. In off-host monitoring installation scenarios, the agent monitors a service remotely, running on a different host of your choosing. 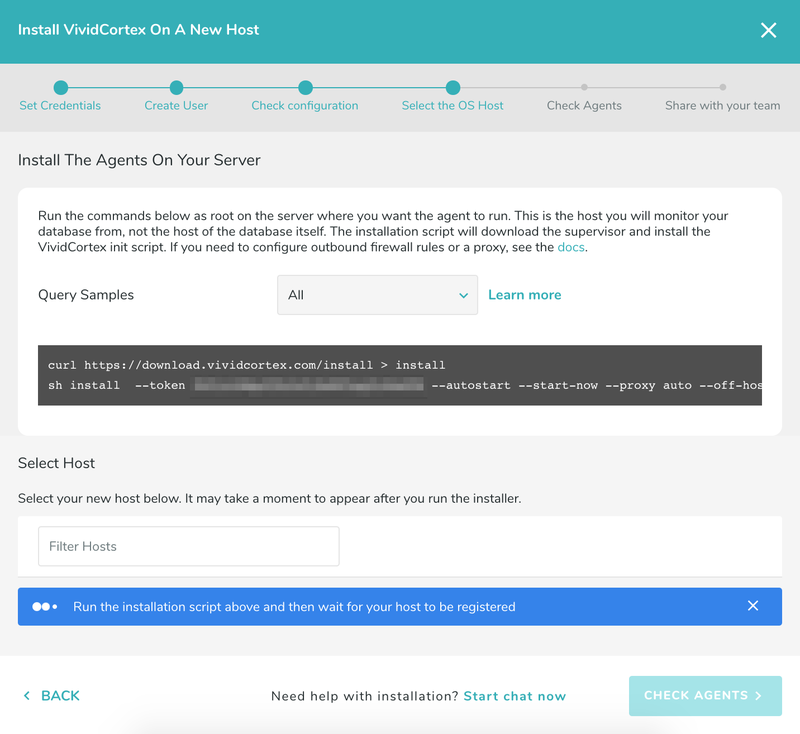 Run the installation script on the host where the agent will live (not the host it will monitor), and select that host when it appears in the wizard. Note that you will NOT see the host which you are going to monitor, only the host where the agent will run. To install the agent off-host with the ability to migrate to other servers transparently, please refer to the “Moving Agents to a New Host” section. Once the agent has checked-in successfully, you can finish the process by inviting any users who need access to VividCortex in the last step. If you have any problem with the agent install, do not hesitate to contact us by clicking the button in the bottom right corner of the application. See below for information on enabling the PERFORMANCE_SCHEMA or pg_stat_statements on your RDS instance. Create a new custom DB Parameter Group in the RDS Dashboard, or modify an existing one. In both cases you’ll need to restart the server/instance for the changes to take effect. You will need to create the file if it does not exist. More information about configuration files, including correct JSON formatting, is available here. The first line is required to make the extension available in the server, the second one is recommended if you have long queries, and the third one is used to track statements inside stored procedures. Set an option for each of the settings discussed above. as the user you have created for use with VividCortex. If this does not return successfully, it is likely that pg_stat_statements does not exist on the database the VividCortex user is connected to, or the VividCortex user is not a SUPERUSER; run CREATE EXTENSION pg_stat_statements on that database and ensure the user privileges are correct. We support downloading metrics from Amazon CloudWatch for your RDS or Aurora instance. This allows you to see system metrics, such as CPU and memory utilization, alongside your query data; this provides critical pieces of information necessary for diagnosing database issues. The list of metrics we collect from CloudWatch is here. The AWS managed CloudWatchReadOnlyAccess and AmazonRDSReadOnlyAccess policies work, so make the user a member of a group that implements both of those. We strongly recommend using these managed policies, as they are future-proof and easier to implement. You should see CloudWatch metrics appear on your environment Summary page under the section “How healthy are the resources?” if the setup is correct. You will also begin to see data in the two CloudWatch dashboards, under Charts.